On Sunday October 1, 2006, Rev. Tony Ponticello addressed the congregation at the Community Miracles Center in San Francisco, CA. What follows is a lightly edited transcription of that talk. As some of you know, over the past month or two I’ve been quoting little bits and pieces of something I wrote many years ago for the Internal Revenue Service which was a summary of the thought system of A Course In Miracles (*1). It’s my goal to quote consecutive bits of this as we go along through this year and to talk about them as they relate to whatever seems to be going on in the world. I’m calling this my “Basics” series. This would be number three in the series. There are a couple of ideas which I think are very important to focus on. First, that a false idea came into the mind of the Christ – all of us. That idea was that somehow that mind, the Christ, could exist without having been created. That’s the error in thinking. That’s the false idea. The second point, however, is that the problem is not that the false idea is there. The problem is that we don’t recognize the idea as something silly and just laugh at it. I think people want to get the idea out of their head but the idea is not the problem. The problem is that we take the idea seriously. We may always get these false ideas. Obviously we were in Reality, in Heaven, and false ideas were coming into our minds. The problem was we took one of those ideas seriously. We didn’t laugh at it. The A Course In Miracles quotation that goes along with this says, “Into eternity, where all is one, there crept a tiny, mad idea, at which the Son of God remembered not to laugh. In his forgetting did the thought become a serious idea, and possible of both accomplishment and real effects.” (T-27.VIII.6.2-3) Once again – the problem isn’t the false idea. The problem is that we take the idea way to seriously – and we’re doing this all the time. Another key idea in A Course In Miracles is not to focus on that we did this many millennia ago or even that we did this at the beginning of time. Another very important idea in ACIM is we’re still doing it. We’re still forgetting to laugh at the mad idea that: somehow we’re separate, somehow we weren’t created, somehow we weren’t authored, somehow we weren’t defined. We keep trying to define ourselves instead of surrendering into what we are, which was defined in our creation. A Course In Miracles tells us, “There is, however, no point in giving an answer in terms of the past because the past does not matter, and history would not exist if the same errors were not being repeated in the present.” (T-4.II.1.3) We’re making that same error all the time. We’re taking things way too seriously. We should be laughing a lot more. We should be amused a lot more than we are. We should see the cosmic joke of the universe. Most enlightened people do. In the Hindu tradition, and the Buddhist tradition, frequently we hear that upon enlightenment the devotee laughs. He starts to laugh. The cosmic joke is realized. That’s why we have a little picture of the Laughing Buddha on the cover of the program. The Laughing Buddha is a great symbol of this cosmic joke. The Laughing Buddha always laughs. It doesn’t matter what is going on in the world. The Laughing Buddha has a smile on his face and is always amused by the world regardless of what the world may show him. What I learned from my internet investigations is that the Laughing Buddha isn’t the Buddha who we usually think of, the one who gained enlightenment under the Bodhi tree. This was a different Buddha. The laughing Buddha pre-dates the other Buddha and some say the Laughing Buddha is actually a “pre-incarnation” of the soul which would later become the Buddha that we know who founded Buddhism. However, I also learned that this idea is just a myth. There’s no proof, or any kind of witnessing, to that. It’s just a happy myth that many Buddhist like to embrace. I also learned that this Laughing Buddha is very much like the western image of Santa Claus. He comes into town, jolly, rotund and has a bag full of goodies – sweets and little toys mostly for children. He gives them to the children, and adults sometimes as well, and the bag never gets empty. It’s a mythical, miraculous bag, so the more gifts and sweets the Laughing Buddha pulls out of his bag the more there is. Because this Buddha is rotund, heavy and has a big belly – he’s always supposed to show his belly button. People rub his belly as a way of picking up some of his abundance and good luck. That’s what the Laughing Buddha does. I like that image. I want to be a Laughing Buddha. I don’t want to take the world too seriously. I want to see the cosmic joke in it all. And there is a joke in it all if we learn to perceive it correctly. A Course In Miracles says, “In gentle laughter does the Holy Spirit perceive the cause, and looks not to effects.” (T-27.VIII.9.1) The problem is we look out there into the world and think that something not nice is going on out there but we’re just looking at an effect. We’re not looking at the cause. If we really got that it’s our own minds that are the cause of this disturbing appearance we would see how amusing it all is. It’s all within us. It’s not external to us at all. That’s a very profound and challenging statement. It doesn’t say that we just laugh at the things which seems amusing or humorous. It says, see the humor and the amusement in everything, even the things that seem so tragic: poverty, starvation, death, war .... Learn to laugh at those things as well. That’s where salvation lies. That’s why the Laughing Buddha is a good image for this. 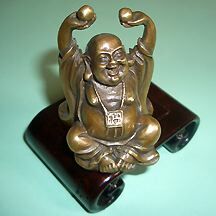 The Laughing Buddha is always laughing – understanding the cosmic joke, understanding where true abundance lies, understanding that abundance is in never ending supply and that the more we pull out of our little hemp bag, or bag of hemp, (laughter) the more there is. There is never a problem of lack in the world. The problem is only in our thinking that a lack of some kind is out there. A Course In Miracles says, “ ... sickness is of the mind, and has nothing to do with the body. What does this recognition ‘cost’? It costs the whole world you see, for the world will never again appear to rule the mind. For with this recognition is responsibility placed where it belongs; not with the world, but on him who looks on the world and sees it as it is not. He looks on what he chooses to see. No more and no less. The world does nothing to him. He only thought it did.” (M-5.II.3.1-8) That is the cosmic joke and it “costs” us the world. The world isn’t doing anything to us. We only think it is. We don’t see that we are the cause of the world. When we get glimpses of that, it all seems so amusing to us. We take our seriousness so seriously. If we could just learn to laugh at the seriousness that would be the beginning of a correction but we don’t even know how to do that. We take our seriousness way too seriously. There’s a very “serious” issue going on in the A Course In Miracles community now. Many of you know of it. Recently it had a new chapter, so to speak. The new chapter revolves around a respected teacher, Jon Mundy, who publishes this A Course In Miracles magazine, named Miracles (*2) (Rev. Tony holds up the latest issue of Miracles, Vol.5 No.5,/Sep. Oct. ‘06). Jon Mundy, for almost two years, was a great supporter of Gary Renard the author who wrote the book, The Disappearance Of The Universe which is supposed to be telling a biographic and true story. But of late, Jon Mundy has decided that Gary Renard made the whole story up and that Arten and Pursah, the two “Ascended Masters” in his book didn’t really materialize to Gary. Jon Mundy believes that Gary is pulling a hoax, or a lie, on the ACIM community. Jon has written an article about it in this issue of Miracles. He’s also asked Robert Perry to write an article so Robert has contributed an article as well. Greg Mackie, another teacher at The Circle Of Atonement, has also written an article that appears in this same issue. This issue has those three articles all trying to state, and in a way prove, that Gary Renard is indeed lying and that none of this actually happened. It’s being put out there like it did happen but, they believe, in truth, it did not. Now, what Jon Mundy has written is that next month Gary Renard is going to get his chance to write an article in response to their articles. I’m eagerly awaiting the next issue of Miracles. In this sense, Jon Mundy has been very successful in creating enthusiasm for his next issue. This is the first time that I have eagerly awaited an issue of Miracles (laughter). Now I can’t wait to see what Gary Renard has to say. Jon Mundy has successfully created a new market for his magazine on this topic. We have a lot of copies of this back there and I recommend that you take one. Read these articles. They are well written and they are very interesting. I’m sure Gary Renard’s response will also be very interesting. It is all interesting. I just don’t know how significant it is. It’s very interesting; I’m engaged. I want to know. But how meaningful is this whole discussion? Did Gary make it all up? If Gary indeed did make it all up, and I’m not saying he did, I think the more profound question would be, “Why did we make up a reality in which there is an author named Gary Renard who made up a story that he peddled as true to manifest a best seller?” That’s the only significant question because we are the cause. If we don’t come back to true cause then we won’t see the joke. The joke is we dreamed the dream that is the world. If there are authors in it who are lying we dreamed them up. That’s the joke. (laughter) I didn’t hear Jon Mundy, Robert Perry or Greg Mackie approaching this issue from the perspective of true cause. In my mind, that is the A Course In Miracles perspective. Isn’t it amusing that we manifested this in the world? Why, then, did we manifest these noted and respected teachers who are now taking a position about Gary Renard and The Disappearance Of The Universe? We made that all up too. We made up Jon Mundy, Robert Perry and Greg Mackie in our minds as well. We are making up their challenge of Gary Renard. Why did we do that? Why is our A Course In Miracles community doing this? Some people think this is divisive for the community. I can buy into that too. “It’s divisive. It’s factionalizing the community.” Listen, I’ve been in this community for many years. This community has always been divisive and factionalized. This is no different. (laughter) If anything, it is sparking a conversation. Conversation is communication. Communication brings people together and it’s actually very valuable. It’s probably not divisive at all if we choose the right perspective of it – laugh at it, like the Laughing Buddha. See the joke. See that we are manifesting it all. It can actually be a great tool for bringing this community together in a very interesting conversation. In the sense that it brings us all together, then this conversation can become not only interesting but possibly significant as well. Three of these teachers, Gary Renard, Robert Perry and Jon Mundy will be at our conference in February. All of them will up there addressing the five or six hundred people who hopefully will be in attendance. That could be very interesting and hopefully even a little significant. A Course In Miracles has this quotation which comes to mind when I read all of this stuff. “If you would know your prayers are answered, never doubt a Son of God. Do not question him and do not confound him, for your faith in him is your faith in yourself.” (T-9.II.4.1-2) Why get involved in something that is doubting any of them? Doubting Gary Renard? Doubting Jon Mundy’s agenda? Doubting Robert Perry’s agenda? Why get involved in any of this challenging people and confounding them. I want to have faith that they all are following their guidance to the best of their ability because I want to reinforce my own ability to follow my guidance. If I challenge them – somehow they aren't following their guidance or they are lying for their personal benefit – then I’m reinforcing something within me I surely do not want to reinforce. I need to just find the humor in all of this. I need to be amused. If we could all do that then our amusement might be the gift that is in our little hemp bag (laughter) that we bring to the world. That’s a good question that we always should be asking ourselves? What is in our hemp bag that we carry with us? What do we offer to the world? Whatever it is – it should be that little delicacy, that little sweet, that little thing that makes people smile. If it is that kind of thing then it indeed will be in unlimited supply. The hemp bag will never get empty. It will be like Santa Claus’s bag that always has toys in it. Or like the “Hippy” woman’s bag that always had “Warm Fuzzies” in it – if you know that little fable. (*3) It will always have them in it. There might be some idea of scarcity but that scarcity doesn’t really exist. This whole controversy centers around a pet issue of mine which has gotten me in a lot of trouble over the years. I’m going to say it again anyway and it’s probably going to get me in a lot of trouble again. It’s the issue of honesty. We elevate this thing called honesty up there and then reject people because of it. Or, we accept people because we think they are being honest. What is this issue of honesty? Listen, nobody is honest 100% of the time! I don’t know anybody who’s honest 100% of the time. We all lie and if we say we don’t that’s the biggest lie of all! (lots of laughter) All of us stretch the truth, leave out certain details, misrepresent – why does it matter? Somehow we’ve accepted this idea that we are in danger, or that we are threatened, and people have to tell us the truth because if they don’t tell us the truth that will hurt us in some way. That is frequently what is underneath the idea that people need to be truthful to us – because if they don’t we might be hurt. That’s attacking your basic invulnerability. In truth, we are all invulnerable. We can’t be hurt. It certainly doesn’t matter if somebody is honest to us or not. Is the A Course In Miracles community somehow in danger? Are we in danger because any author might be lying? Of course not. Does anything have to be protected? I don’t believe so. Honesty ultimately has to do with something a body does. A body tells a lie or misrepresents. A Course In Miracles says, “The body is emphasized, with special emphasis on certain parts, and used as the standard for comparison of acceptance or rejection for acting out a special form of fear.” (T-18.I.3.7) People love to use honesty as a way to righteously reject people and that’s the one thing that troubles me the most about it. We shouldn’t be rejecting anybody. I always accept that I don’t know if somebody’s telling me the truth or not and it shouldn’t matter. Actually, if it doesn’t matter for me, then they have more of a tendency to tell me the truth because they see I don’t get upset if they get caught in a lie. Why do we not tell the truth? Why do we lie? Frequently because we are concerned that the other person is going to get upset. They might attack us or they might reject us. If we stopped rejecting, nobody would lie. Ultimately it’s our responsibility whether somebody is lying to us or not. “Why are we setting up the energy that causes somebody not to be truthful to us?” is a much better question then, “Why did the dirty scum bag lie to me?” (laughter) What did we do that set that up? There is an A Course In Miracles teacher from Portland, Oregon named Judy Allen. Something that she told me, I always remember. “I never lie – unless I absolutely have to.” (lots of laughter) The whole world is a lie! Doesn’t ACIM tell us that? The whole world is a lie! It doesn’t exist; it’s lying to us all the time. Yet, we’re so concerned with lying. Unlike many of my other esteemed colleagues, I really have no position on whether The Disappearance Of The Universe was the truth or not. It doesn’t matter to me. Also, unlike many of my esteemed colleagues, I don’t take any position – I don’t have any statement or policy – about even whether A Course In Miracles actually came to us from Jesus. How do I know? How can I prove that? Who the hell knows what was going on in Helen’s mind and with her relationship with Bill Thetford? She had very specious motivation and she certainly had a personal investment in the whole thing. If you read the biographies and other things written about Helen Schucman it is usually said that Helen Schucman had an attraction, a romantic or even a sexual attraction, for Bill Thetford. She was trying to engage him emotionally. It is usually said that Bill Thetford couldn’t return her affections because he was gay. I always find this amusing. Why? Why is it because he was gay? Might it have been that she was 14 years older than he was? Might it been that she was married? (laughter) Might it been that he was her boss? Might any of those things had something to do with why he didn’t return her affections! Why is it because he was gay? Does every straight man just automatically jump any woman who makes a pass at him? Is that the inference here? “If he hadn’t been gay he certainly would have gone for it!” (laughter) I don’t know about that. The “gay” reason is an insidious form of male bashing and I reject it. A Course In Miracles was channeled between 1965 and 1972. Bill, in between those years, was 42 to 49 years old. Helen, on the other hand, was 56 to 63 years old in those years. Now think, when she apparently couldn’t get this younger man’s interest, romantically or even sexually, and also when her frequent neurotic outbursts apparently didn’t seem to captivate his attention either, she came up with this other thing that he was interested in, this psychic phenomena thing. Now, for the next seven years she had his rapt attention. Every morning they had this personal, intimate time together. She frequently needed to be comforted. He would hold her hand. She had a personal investment in all of this. She did just the thing she needed to do to get this tall, handsome, younger man to pay attention to her. Now, if I was going to throw things out on the basis of might there have been another agenda, I’d have to throw out all of ACIM. There might have been another agenda. Who knows what was going on in Helen’s mind? Who knows what was going on in Gary Renard’s mind? Who knows what is going on in Jon Mundy’s mind? As I’ve said, for the first time I can’t wait for the next issue of Miracles to come out! Jon’s got a personal investment for bringing a little good controversy to his publication. It’s good for him. He’s a teacher and author. He publishes a magazine. He wants more readers. He wants to sell books. He wants to be an important person in the A Course In Miracles community. It was also interesting to me in Robert Perry’s article – I’ve known Robert Perry for years and I really like him and he has always had a personal investment in trying to prove Ken Wapnick’s theories wrong. So Robert, perhaps, uses this controversy for his pet agenda. Robert shows what Gary Renard is doing is borrowing Ken Wapnick theories, which Robert Perry believes to be wrong and not in the Course. Once again, Robert gets to show how his theories are different from Ken Wapnick’s. Why, Robert asks, would these Ascended Masters come and dictate to Gary ideas that aren’t in the Course – that are Ken Wapnick’s ideas which Robert Perry thinks are wrong. That’s Robert Perry’s personal investment. His motives are suspect as well. We’re all suspect! Rev. Tony Ponticello is suspect. I’m trying to take a middle of the road position here. Well of course I am. We’ve got this A Course In Miracles church. We don’t want to piss anybody off! (laughter) We don’t want supporters to drop out! Rev. Larry and I are very cautious and careful about how we present these things. We’ve got a personal investment. Of course we do. Everybody in the world has a personal investment. The world can’t be believed. The whole world is lying to us all the time because we are all seeing things through our own agendas! In my mind it shouldn’t make any difference and we should all learn to laugh at it. We have an unlimited supply of laughter, amusement and good natured perceptions that we can offer to the world. We all can be the Laughing Buddha. We all can bring that gift and we all should be bringing that gift. That’s the gift that Rev. Tony, Rev. Larry, Jon Mundy, Robert Perry, Greg Mackie, Gary Renard, Helen Schucman and Bill Thetford could truly bring to the A Course In Miracles community. We can bring that, offer that, and not worry about all the rest. A Course In Miracles tells us, “It is surely good advice to tell you not to judge what you do not understand. No one with a personal investment is a reliable witness, for truth to him has become what he wants it to be.” (T-12.I.5.1-2) We haven’t the criteria to judge anything that goes on out there because we all have a personal investment. The very people who are writing all of these article all have a personal investment. They are part of the community itself. At best, if someone wanted to do a critical evaluation of what is going on it should be somebody outside of the community with no investment in the community at all. Then maybe there would be true objectivity. However, even then it is suspect. I wrote my article on this whole controversy in January of 2006 for our own publication Miracles Monthly. (“The State Of The Church” Vol.19.No.11./Jan.’06). Their articles just came out this past month so I beat them to this scoop by eight months! (laughter) This is old news to me. People have asked me how I was going to respond. I said, “I responded to this in January.” Maybe it was my article that inspired them to do what they are doing. I don’t feel a need to respond anymore. I feel I’ve put as much into this as I need to put into it. I know I want to stay open to everybody. Everybody has a contribution. I know I study a discipline that helps me. That’s all I need to know about it. I can play the game of Jesus writing A Course In Miracles in my mind. Sometimes it is useful to play that game – and sometimes it’s useful for me to let go of that whole idea. I don’t know who Jesus was. Since we’re manifesting the entire world, in truth I wrote ACIM along with all of you. We wrote it. It’s a book that appeared in the dream that is in our minds. We wrote it. We can embrace it as our own truth, just like anything and everything else. We can laugh at all these insane notions we have of trying to figure things out. That’s it for today. Thank you. *1) *The Thought System Of A Course In Miracles* is sold as a one page laminated plaque by Community Miracles Center. This article appeared in the September 2006 (Vol. 20 No. 7) issue of Miracles Monthly . Miracles Monthly is published by Community Miracles Center in San Francisco, CA. CMC is supported solely by people just like you who: become CMC Supporting Members, Give Donations and Purchase Books and Products through us.